If you’re planning to walk the West Highland Way and have been utilizing our Guide to Camping on the West Highland Way you’re likely wondering what to pack for your own adventure. Below you’ll find a detailed packing list that will provide you with great, trail-tested gear that won’t weigh down your backpack too much. This list reflects our personal packing list which will vary for each individual’s specific needs. However, this should serve as a great starting point for planning your own West Highland Way adventure! You can also pick-up our printable West Highland Way packing list as part of our Complete Guide to Camping on the West Highland Way for under $5! You’ll also get access to tons of useful information for planning your WHW adventure! MSR Hubba Hubba Tent This is the best budget tent on the market and the best overall tent on the market! Sleeping pad Nemo Astro Sleeping Pad If you are a side sleeper this is a must! Pillow Therm-a-Rest pillow If you're camping more than a few nights you will be glad you packed this! Stove MSR Pocket Rocket Stove Ian has used this stove for nearly a decade and highly recommends it! Utensils Humangear Spork Best $4 you will ever spend! Multi-tool Gerber Suspension Multi-Plier Perfect for cutting cheese and bread! Camel Bak Camel Bak Crux - 100 oz. Way easier than a water bottle! Small day-pack Cotopaxi Luzon 18L Great for walking around town and hiking up Ben Nevis! Pack-cover Sea to Summit Pack cover This is a truly essential piece of gear given how much it can rain on the WHW! Trekking poles Black Diamond Trail Back Trekking poles Essential for long downhills! Travel towel Sea to Summit DryLite Towel Great to have for campsite showers. Dry bags Sea to Summit Ultra-Sil Dry Sack Keeps your clothes and other items dry in a downpour! Hiking Gaiters Outdoor Research Rocky Mountain High Gaiters These will help keep your boots dry when walking. Midge Hat Midge Net Hat Do not leave home without one! Sleeping Mask Alaska Bear Sleeping Mask The sun sets late and rises early in Scotland! Bug spray Ben's Insect Repellent You'll be glad you brought this when the midges come out. Ear plugs Mack's ear plugs Essential for the more crowded campsites! Camera Sony a5100 mirrorless camera Ian loves his Sony mirrorless camera! Tripod Joby GorillaPod The perfect travel tripod. Unlocked phone Moto G Play A simple, budget-friendly phone to use for navigation and local calls with a SIM. Battery backup Anker PowerCore 20100 Great for charging electronics when you don't have access to an outlet. Laundry Soap Sheets Sea to Summit Trek and Travel Pocket Soap These are the greatest travel hack ever! The best way to clean your clothes on-the-go. Travel adapter Joomfeen All-in-one adapter Great for all of your travels. Plastic Bags- quart, gallon, and garbage bags. We used these constantly for everything from storing trail mix to keeping our sleeping bags dry. A must-have for backpacking. Underwear (5-6 pairs) Adidas Climacool underwear Very packable and easy to wash on the go! Socks (5-6 pairs) Darn Tough Micro Crew Socks In our opinion, these are the best hiking socks available. Your feet will thank you! Sports Bras (2) Brooks Rebound Racer Sports Bra This is the most versatile, comfortable, and high-quality sports bra that Emily has found on the market. Flannel shirt (1) Columbia Simply Put II Flannel Shirt Emily enjoyed having something soft and cozy to put on after a day of hiking. Running shorts (1 pair) Lululemon Run Speed Shorts These shorts are so comfortable, packable, and quick-drying, that Emily didn't even feel the need to buy hiking-specific shorts. Down jacket Patagonia Down Sweater Lightweight, super warm, and packs down small. This jacket was perfect for this kind of trip! Rain jacket Outdoor Research Helium II Jacket A high-quality all-weather jacket that packs up small. Rain pants Columbia Storm Surge pants For those heavy downpours! Hiking boots Keen Targhee II Mid Hiking Boot Emily has had these boots for five years and hundreds of muddy, snowy hikes, and they are still going strong! Sunglasses Suncloud Loveseat Polarized Sunglasses Good quality sunglasses are essential when you're in the mountains all day. And these are stylish too! Basic black dress prAna Cali Dress For the nights we went out to dinner in town, it was nice to have one non-hiking outfit. This comfortable, versatile dress was easy to pack and worked great. Sandals/Camp shoes Chaco Z1 Super comfortable around camp with great support. Underwear (4-5 pairs) Exofficio Give-N-Go boxer Highly recommended! You can bring 4-5 pairs and wash them easily in sinks or showers. A must! Socks (4-5 pairs) Darn Tough Hiker Micro Crew In our opinion, these are the best hiking socks available. Your feet will thank you! Hiking pants (1) Prana Brion pants These are great for hiking and also look great walking around town! Hiking shorts (1) Prana Brion shorts Awesome shorts that are great for hiking. Rain jacket Outdoor Research Helium II jacket A good rain jacket is a must! Hiking boots Vasque Talus Ultradry Super comfortable and super waterproof! 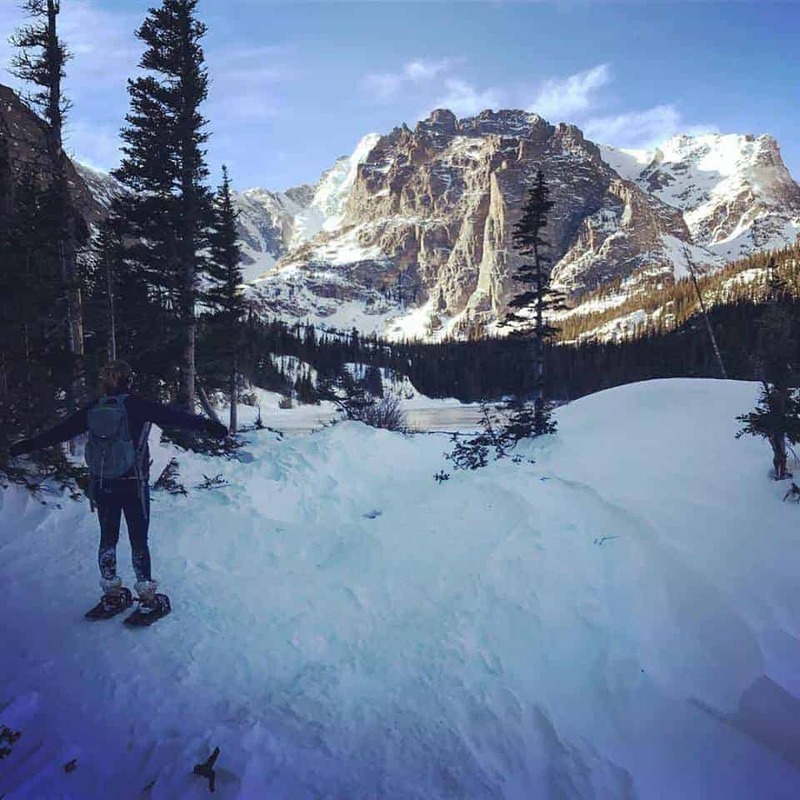 While snowshoeing shares many similarities with summer hiking, it does require some different gear. Our packing list will ensure that you have everything you need to stay warm and get the most out of your next snowshoeing adventure. Snowshoes (Men's) Crescent Moon Silver 9 Snowshoes This local Colorado company makes the best snowshoes around. They are lightweight, comfortable, and durable. Snowshoes (Women's) Crescent Moon Silver 13 Women's Snowshoes This women's-specific model is engineered for the female body to make walking in them feel more natural. Men's Snow Boots Salomon Men's X Ultra Winter Boots Ian has used and loved his Salomon winter boots for over 10 years! They still keep his feet warm and dry. Women's Snow Boots Sorel Women's Caribou Boots These boots are comfortable enough to hike in all and stylish enough to wear into town at night. Baselayer SmartWool Merino 150 Baselayer- Long Sleeve These shirts are expensive, but they are truly amazing! Always warm, not too hot, never smelly, and they last for years! Gaiters Outdoor Research Men's Rocky Mountain High Gaiters High-quality gaiters are an essential piece of snowshoeing equipment for keeping your feet warm and dry. These gaiters stay firmly in place and they are completely waterproof. Smaller women: Be sure to buy the women's-specific model, as the men's may be too large. Ski Goggles Bolle Mojo Snow Goggles These offer much-appreciated protection from the wind, snow, and sun. Snow Baskets (for hiking poles) Kelty Snow Baskets Poles offer great stability and support when hiking on deep or slippery snow/ice. These inexpensive baskets will keep your poles from slicing all the way through the snow. Hydration Bladder CamelBak Unisex Crux Hydration Reservoir- 1.5L While not a necessity, a bladder will allow you to drink frequently without having to stop hiking and take off your gloves to open a water bottle. It also keeps your water from freezing, since it's kept warmer near your body and inside your pack. Down Jacket Patagonia Down Sweater Super warm when you need it, and perfectly packable and lightweight for when you don't. Fleece Jacket Marmot Norhiem Women's Sweater Knit Fleece Jacket This is the perfect mid-layer. It adds a lot of warmth without being too bulky. Glove Liners Seirus 2116 Innovation Heatwave Glove Liner Sure, these shiny silver liners look a little silly, but they work! They add quite a bit of warmth, while being thin and flexible underneath your heavier outer gloves. Gloves Hestra Fall Line Leather Gloves These are the warmest, most flexible gloves around. Well worth the money! Hat and/or Ear Warmer The North Face Triple Cable Pom Beanie This hat is warm and cozy, stays in place on your head, and looks great. Thermos of Hot Cocoa or Coffee Trust us, you'll be glad you brought it. We hiked the Tour du Mont Blanc in July 2017, camping most nights. If you’ve read our Guide to Camping on the Tour of Mont Blanc you may be wondering what our packing list looked like. Well, here it is! Below you’ll find a detailed packing list that will provide you with great, trail-tested gear that won’t weigh down your backpack too much. This list reflects our personal packing list which will vary for each individual’s specific needs. However, this should serve as a great starting point for planning your own TMB adventure! You can also pick-up our printable TMB packing list as part of our Complete Guide to Camping on the Tour du Mont Blanc for under $5! You’ll also get access to tons of useful information for planning your TMB adventure!